New York Taiko Aiko Kai began in October 2002, when a small group of young children first played Japanese drums in an Upper West Side public school. 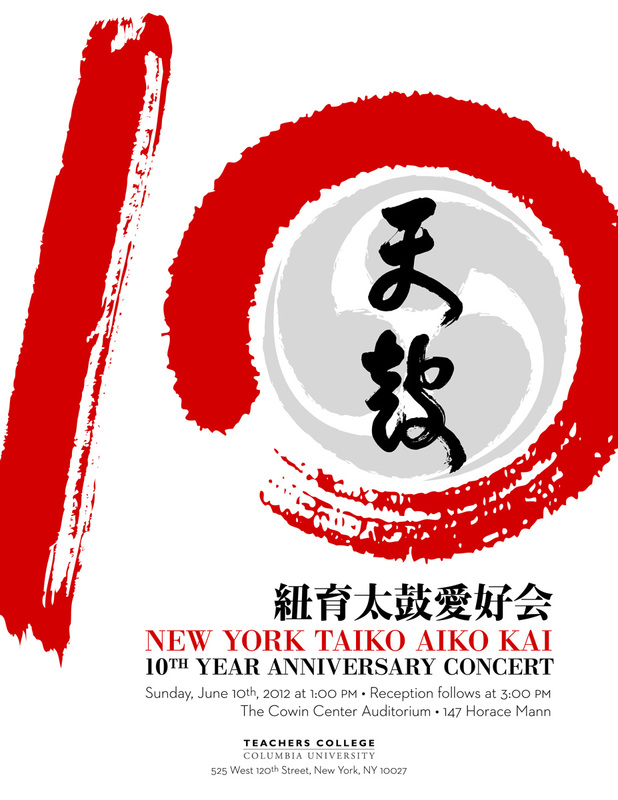 Their families, wishing to pass Japanese culture to their children, began to get together to practice Taiko, and New York Taiko Aiko Kai (NYTAK) was born. Our group name was given to us by the late Grandmaster Daihachi Oguchi of Osuwa Daiko and the father of Kumidaiko (ensemble) in August 2003 when some members visited Okaya City in Japan where Osuwa Daiko is based. Ten years later, we have grown to almost 50 taiko loving members coming from all backgrounds and ages. There is no other taiko group like ours in the New York metropolitan area. To commemorate all of our accomplishments and to send off some of those founding members that are leaving for college next year, we are proud to announce that we will be having a concert for our families, friends, and the community who supported us all these years. We are inviting our teachers, Hiro Kurashima sensei and Kaoru Watanabe sensei to this event as well as our sister groups, Biwanko and Sakura Daiko. We hope you will join us for this special occasion! Sunday, June 10th, 2012 at 1:00 p.m. Reception follows at 3:00 p.m.
We look forward to seeing you there! Please email NYTaiko@gmail.com if you are interested in attending. One of the finest Taiko groups in Japan, Sukeroku Taiko, was in town this past weekend for a wonderful performance at the Riverside Church for "The Festival of Japan: Drums + Dance", and we were lucky to have them come in for a workshop! It was a very special occasion to learn directly from the Sukeroku Taiko performers. Some members of Biwanko, and the dance group Minbu (民舞) joined us as well. We learned a short and fun piece, a variation of Matsuri music played during Bon Odori, or Bon Dance. The Sukeroku style of taiko, played on the slant stand, is very different from our Suwa style but the director and the instructor, Sensei Imaizumi, taught us that even if we have different styles of taiko, we should learn from each other and have fun playing taiko. That's exactly how he plays and how he wishes the audience to feel. The great teacher teaches more than the techniques and Sensei Imaizumi taught us how to be a good taiko player besides learning the techniques. It was truly a wonderful experience. Thank you Sukeroku Taiko!